JAL VISIT TOKOKU! special livery. Image by Japan Airlines. Japan Airlines (JAL) has been running the Tohoku Support Project - "VISIT TOHOKU!" since June 1 2013 to help supporting the area affected by the Tohoku earthquake. Recent initiatives include discounted domestic tickets for foreign visitors to visit Tohoku region and international charter flights to Tohoku. The latest project is to create a special livery to fly all over Japan to promote the VISIT TOHOKU! project awareness. And you get be part of this special livery by contributing your Facebook profile pictures! Also through that, you will be helping to plant some sakura trees in Onagawa, Miyagi too! The JAL VISIT TOHOKU! special livery are made of mosaic photos of the supporters. Image by Japan Airlines. As you can see, JAL will be printing the "VISIT TOHOKU!" (in Japanese) in this special livery. And those characters will be your Facebook profile picture mosaic! For every 1,000 participate, JAL will plant 1 sakura tree in Onagawa, Miyagi, a town that was destroyed by the tsunami. This is to help restore the area which was surrounded by beautiful sakura trees before the earthquake. JAL plans to plant a total of 12 trees from November 2013. 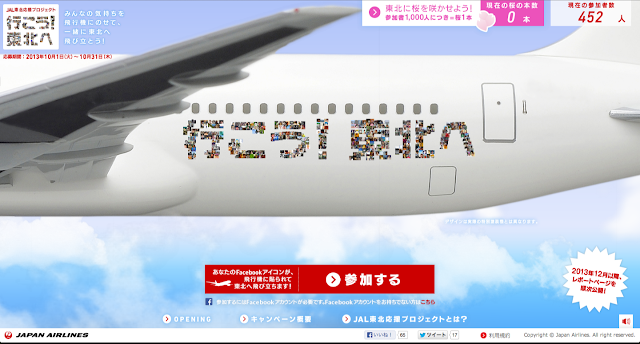 Special website for the JAL VISIT TOHOKU! special livery. Image Japan Airlines. So to contribute, simply sign in to Facebook then visit the special site for this project (Japanese only). Click the big red button at the bottom of the page. Then it will prompt you to sign in to Facebook if you haven't done so already and have you confirm your profile picture and agree to the terms (just check the box and hit the button). Finally it will ask if you want to like JAL Facebook page. You can hit skip if you don't want to or you have already done so. Then just wait till your face appear on the special livery! JAL will be accepting participants between October 1 and 30 2013. Also, in the front page, you can tell the number of participants (number in red) so far and the number of sakura trees will be planted (number in pink). JAL will be flying this plane all over Japan from December 2013. Although the press release doesn't mention the equipment type, from the picture you can tell this is a Boeing 767-300ER. Not sure how many planes will be painted with this special livery though. JAL could potentially paint multiple planes and even the smaller 737-800 just like how it did with the JAL Happiness Express livery.